So that cute girl from work (who honestly is way out of your league) has agreed to go out for drinks! What's that? You're nervous? Of course you are! You are an incredibly dull, uninteresting nerd! Not to fear! With just the right amount of booze you can become a master of conversation! Yeah. I'd like to see how he incorporates the educational part. C64 palette? I approve! Also, this competition needs more dating sims. Hmm... Now that I think about it, I'm not sure what the educational part would be...I guess there will be a responsible drinking message, but I don't want it to get too preachy. EDIT: While I'm thinking of it, I could use some help: If you have any ideas for lame jokes, innapropriate lines, or offensive drunken ramblings, please send me a private message. If I use your ideas I'll put your name in the credits! OK... I haven't been working much on this game for the past couple of days, but I got a quick prototype out. 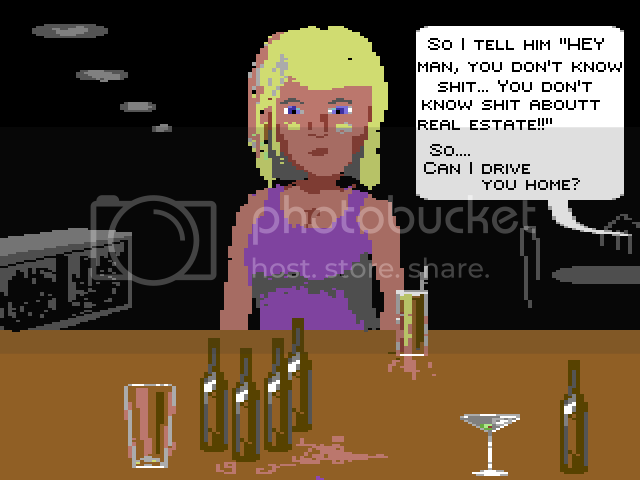 Right now, it just lets you click on drinks as they pass by, and you level of inebriation will affect what you say. You have to keep the balance in order to hold an interesting conversation without looking like a douchebag. I think this will just be one level of the full game. It seems... incomplete... in more ways than one. Ok, played it now, seemd rather uncompleted. Guess you have stoped working on this? Anyway, I liked the graphics and the effect the drinking had on your eyes, however some more conversation lines would have been nice. And also, the drinks are rather hard to drink in the begining.